Hello talented young people around the world. 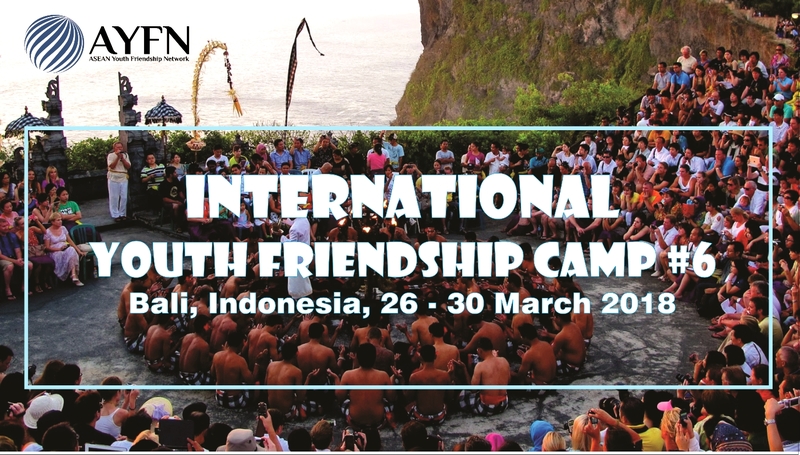 We open the registration process of 6th International Youth Friendship Camp. The camp will take place on 26 – 30 March 2018, in Bali, Indonesia. Come to widen network as well as contribute to better world. WHY SHOULD YOU TAKE PART AT INTERNATIONAL YOUTH FRIENDSHIP CAMP #6? 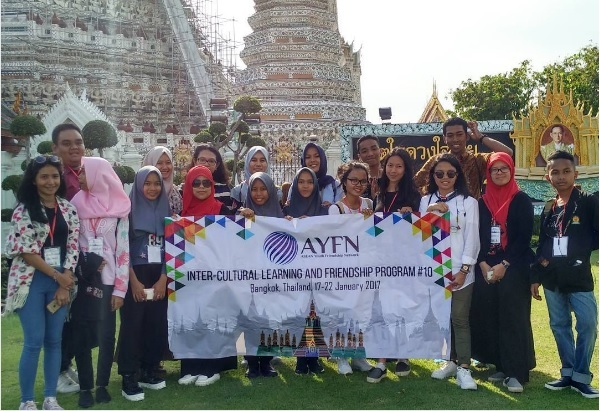 With AYFN, you have the opportunity to become a global student by taking part in Exchange program. Traveling and learning abroad is a unique opportunity and likely to provide some of your most memorable life experiences. Traveling and studying abroad is a great opportunity to meet people, discover new interests and develop your life skills. It can build your confidence, develop your adaptability and hone your resourcefulness, which are all important personal attributes valued by employers. Challenging yourself to live in a different country can be a highly rewarding and stimulating experience, which will open your mind to new cultures and possibilities. It will also develop your learning skills in exciting ways. In today’s world of globally connected business, the network, knowledge and experience you build up while living abroad can give you a competitive edge, as well as bringing a new perspective on your life, aspirations and career options. Being a global citizen can greatly enhance your future career prospects. We are born in different countries, different skin colors, different languages, different cultures, and different places. This camp is the right camp to bridge all campers as one, “one vision, one mission, one community, one world”. The IYFCamp provides activities to discuss about recent global issues (environment and education). Campers will come from different countries and indeed they speak in different languages too. And language will not be a barrier if we try to understand each other. Although this camp will use English as a lingua franca, the camp gives chance for all campers to promote or introduce their national languages to other fellows whom come from different countries. In this session, campers will be divided into small groups, and each group consists of campers from different backgrounds to share their languages. While sharing their languages, campers also have a chance to share their culture. Bali is well known for its diverse culture. Many historical sites can be visited during stay in Bali. In this camp, participants of IYFC will visit temples, holy palaces, etc. This camp offers several activities related to friendship and leadership activities. How to participate at IYFCamp #6? Are you interested to join our camp? Apply now!!! Bali is waiting for you!!! The committee will confirm you whether you are accepted or not after reviewing your application. After getting confirmation from committee, please make first payment to confirm your participation and to reserve slot. limited slot for 50 participants only. Secure your slot now.!! Hotel 5D/4N (twin/triple share) at 3 stars hotel, Airport pick up and transfer (Bali Airport), Meal during program based on schedule (4 BF, 3 L), program activities indicated on schedule, Cultural visit, Welcoming and farewell Dinner, Certificates, AYFN souvenir, T-Shirt and support. FLIGHT TICKET to and from Bali from your home country (city), personal insurance, personal expenses, airport transfer, meal excluded in schedule (dinner), minibar in hotel, laundry, telephone.